Books that help you grow your family tree! 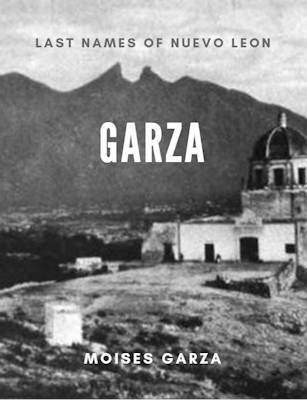 This 483-page book contains five generations of descendants of Marcos Alonso de la Garza and Juana de Treviño Quintanilla. Marcos entered Nuevo Reino de Leon (Nuevo Leon) well before 1610 since in that year he receives a land grant. Marcos Alonso de la Garza is considered to be the progenitor of the Garza last name in Nuevo Leon, Tamaulipas, and Texas. He was born about 1560 in Lepe, Huelva, Spain. He came to Mexico and resided in Mexico city where he probably married Juana de Treviño Quintanilla. He later on moved to Guadiana (Durango), Nueva Viscaya. In 1590 he was in the mining town of Mapimi and later on he lived in Saltillo. Don Israel Cavazos Garza stated that Marcos arrived in El Nuevo Reino de Leon in the early 1600’s with Captain Diego Rodriguez. He also states that Marcos settled near Cerralvo in the Mojarras river in a place named Villaseca located in the Sierra of Papagayos. His wife Juana de Treviño Quintanilla was the daughter of Diego de Treviño and Beatriz de Quintanilla. To date I have identified only seven children of theirs. I have also found references that state that Marcos was married a second time to Catalina Martinez. I have yet to find any valid proof of this marriage or any children of theirs. I believe that Marcos Alonso died between 1616 and 1634. This book is an attempt to document the descendants of Marcos Alonso de la Garza and Juana de Treviño Quintanilla and even at 483 pages, there are many more to be discovered. Research is a never ending endeavor. © Copyright 2019 Last Names of Nuevo Leon. All Rights Reserved. Learn about the progenitors of the last names Benavides, Chapa, De Leon, Hinojosa, Montemayor, Sepulveda, Treviño, and Villarreal in Nuevo Leon with our free introductory guide.